I received product from Oriental Trading Company, but all opinions are my own. 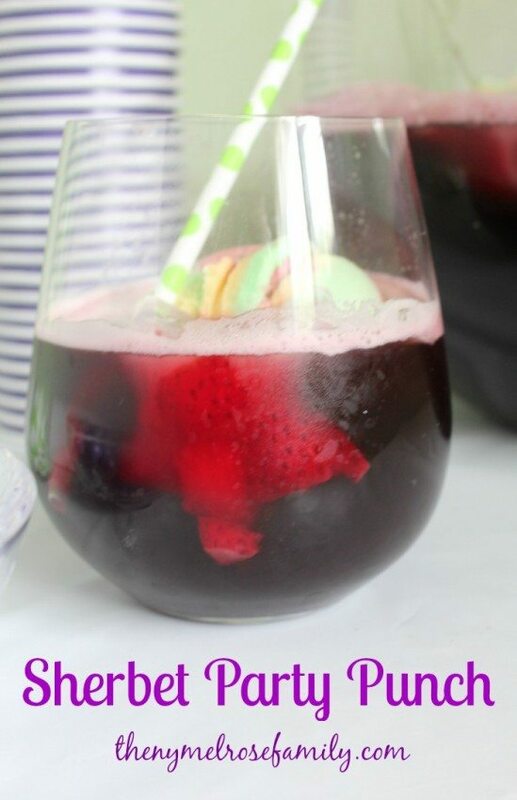 I’ve been sharing bits and pieces of Avery’s Fairy First Birthday Party with you, but today I wanted to share our Sherbet Party Punch that the kids and grown ups all loved. It’s only 3 ingredients so it comes together in a snap. Plus, it always stays cool because one of the ingredients is rainbow sherbet. Although, I definitely love throwing in one of my signature fruit star ice cubes. So fun! Thanks for sharing this recipe. I especially like the idea of using silicone to freeze fruit in fun shapes. I am mostly a water drinker myself, but I do love to have some sherbet punch when they serve it at a party. And now I have this recipe.